Now that this has officially been shared by Tinysuperheroes I can change it to public for you all. Sorry if you were wondering what the heck was going on! Anywho, thank you so much to Tinysuperheroes for sharing our story and officially welcoming us to their Super Squad! From the moment I learned I was pregnant, Aileen was set on being the best big sister. She talked about how she couldn’t wait to help me feed Braxton and play with him and teach him everything she knew. You’d often find her hugging my belly or talking to her brother, just dying to meet him. Throughout my pregnancy, everything went very well and there was no indication that we would have a difficult road ahead. The day Braxton was born was a whirlwind of emotions. He was born June 24, 2011 at 7:58 am weighing 8 pounds 8 ounces and measuring 21 inches long! We were all so excited and our family was anxious to meet him. Sadly, they never did. Braxton was brought to me in the recovery room where I tried to breastfeed him. He would not latch well, and when he did he coughed and gasped and just didn’t seem like he was feeding well. The nurses whisked him away to the nursery and we didn’t see very much of him for the rest of the day. As family looked in on him through the nursery glass, we were so unprepared for the news that followed. Several hours after Braxton was born, a neonatologist came in and explained to us that Braxton had several concerning abnormalities that pointed to some kind of syndrome since they all presented at the same time. Due to not feeding, Braxton’s blood sugar was measuring very low, the doctor heard a severe heart murmur, his ring and pinky finger of both hands were fused together, his two middle toes on both feet were crossed, and some of his facial features were of concern as well. She went on to say that Braxton was going to be transported to another hospital with a better equipped Neonatal Intensive Care Unit (NICU). We were devastated. At 9pm that night, Braxton was wheeled in to my room in an incubator and all I could do was hold his hand through the plastic as he was taken away. Joseph (Braxton’s dad) followed the ambulance through town to the other hospital to get Braxton checked in. He learned that Braxton would undergo several tests overnight and through the early morning in hopes of finding some answers. The doctors assumed the worst and with every syndrome they threw at us, it was clear they didn’t expect our son to survive more than a few weeks. In NICU, we learned that Braxton had a congenital heart defect (bicuspid aortic valve and enlarged aortic root), hypoplasia of the corpus callosum (thinning in the section of the brain that communicates between the two hemispheres), and he failed several swallow tests due to aspiration and poor oral tone. We also ran several genetic tests that all came back with “normal” results. Despite a “normal” test result, the doctors were still certain that something was to blame for all of the anomalies Braxton was born with. At 2 weeks old, Braxton had a G-Tube placed because his feeding was so poor and the doctors were unsure how long it might take for him to eat on his own. At just over 3 weeks, Braxton was finally able to come home. worked with a speech therapist and after a swallow study revealed that Braxton was no longer aspirating we were given the green light to bottle feed. Braxton made slow progress as his oral tone was still very low, but slow and steady we got him up to taking 4-6 ounces by mouth and even eating some purees! 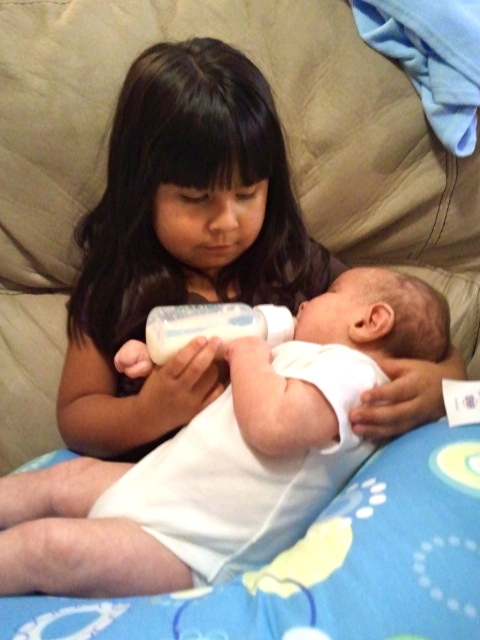 Aileen also finally got to feed her little brother. At 10 months old, Braxton went in to the hospital to have ear tubes placed because he was having constant ear infections. 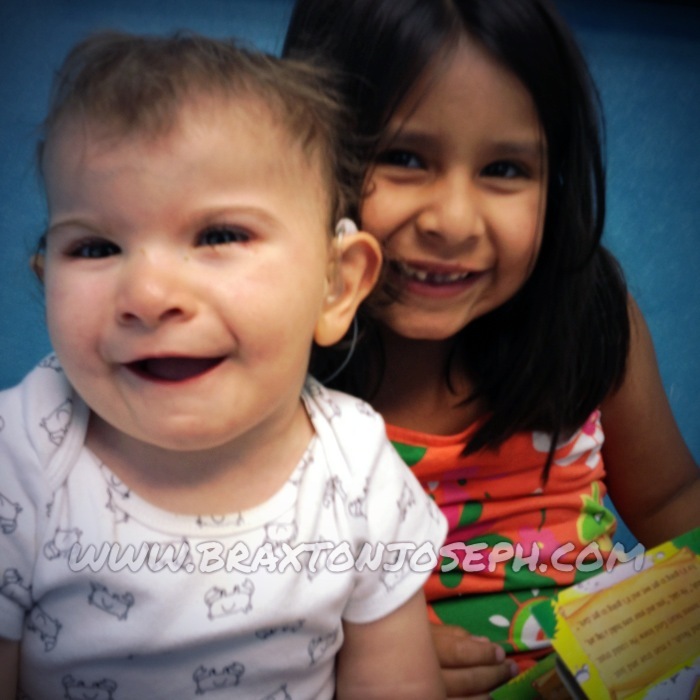 At this time they also did a sedated hearing test because Braxton did not seem to respond to an in office test, despite having passed a newborn hearing screen. We had also learned that Braxton’s tear ducts were abnormal and his eyes were constantly goopy as a result. So, our ophthalmologist also came in at this time to do a probing and irrigation of his tear ducts. Braxton came out of the procedures like a champ. At 14 months old, we still had no diagnostic answers as to what was causing all of Braxton’s features and developmental delays, and Braxton landed back in the hospital with pneumonia and a bad case of croup. This time he was in for about 5 days before he was released to go home. From this point on, we regressed badly with his oral feeding of both the bottle and purees. He began vomiting almost every feed and every time we felt we had a handle on it, the vomiting started again. We changed formulas several times to no avail. At 16 months old, Braxton was back in the hospital for surgery. This time it was to release the webbing of his fingers and another hearing test was also done at this time because the first was inconclusive due to the severe drainage he had from having the ear tubes placed. Braxton came through the surgery very well and had no issues with anesthesia. His hearing test revealed mild to moderate bilateral hearing loss, so we had to begin the process of having him fitted for hearing aids. His hands recovered very nicely from surgery. After a couple weeks of having them bandaged, he was cleared to use his hands fully again, and we’ve seen amazing improvement since the webbing was released. We just had a one year post-op follow up and the doctors was very pleased at how the site healed and is confident the procedure doesn’t need to be repeated any time soon. Naturally, with all of the hospital visits and doctor or therapy appointments, Aileen began to feel left out. We tried so hard to keep her involved and find ways to let her know that she was in fact very special and being a great big sister. She had her moments of bitterness, but she also had awesome moments of being the cheerleader Braxton needed. Now that Braxton is more mobile, she loves to play with him and let him push her over since he thinks it hilarious. Both of their smiles and laughter makes my heart full. Finally, at 21 months old after countless appointments with specialists and therapists, we received results from Whole Exome Sequencing genetic testing. The results came back with several variances in Braxton’s genetic makeup, but the one that stood out was a gene which pointed to Rubinstein-Taybi Syndrome. We finally had an answer and some direction. 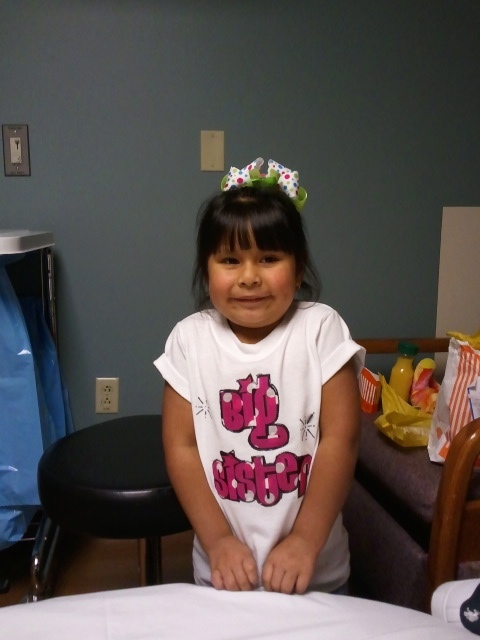 As with any syndrome, there is a wide spectrum as to what this means for any child, but we learned that many of the major medical issues we could expect we already had a doctor monitoring that aspect of the syndrome. Children with RTS usually attain all of the expected motor milestones (sitting, rolling, crawling, walking, etc), but it’s just a bit later than the typically developing child. The greatest obstacle for many of these children is speech. Many are nonverbal, but they do learn to sign very well or use a communication device. There are also quite a few children who talk quite well. We know that Braxton will always have a cognitive delay as well as many other developmental delays, but he is making great progress. At 2 years old, Braxton crawling around lightning fast and learning to pull up on furniture to cruise around the house. Walking is not far away! He is still not eating very well by mouth, but we continue to work diligently with our speech therapist on feeding and speaking. Braxton is babbling some but does not yet have any words. Somewhere around 18 months, something just turned on and we can see the wheels turning in Braxton’s mind and he is ready to take on the world. Through everything, he’s shown us nothing but joy and love. There is definitely some superhero power in that smile of his because his smile lights up the lives of everyone he meets and can change everything for the better. Even in what seemed like dark, hopeless moments, Braxton was able to smile or laugh and has inspired so much hope for us. And although there were some very difficult moments of sibling jealousy, Aileen has been an amazing big sister to Braxton. She loves to help us feed him and talk about him to others. She is constantly talking and singing to him and she is making wonderful progress in learning sign language. Her love for him is incredible. She is his biggest supporter and encourager. We are so blessed to have these 2 incredible children in our lives and we are honored to now be a part of the Tinysupero Squad! 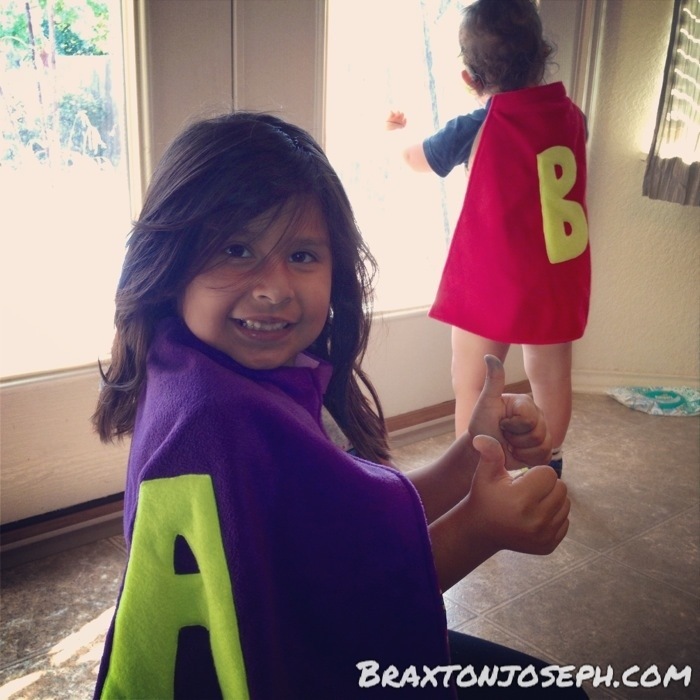 Aileen was definitely more excited about her cape than Braxton, but they both love them. She has been zooming around the house helping Super Braxton and insisted on wearing it out to eat the day she got it just so she could tell everyone about Tinysuperheroes. I’ve got quite the advocate/marketing guru on my hands, so tales of the all the wonderful things your organization is doing are sure to spread through all of Texas. 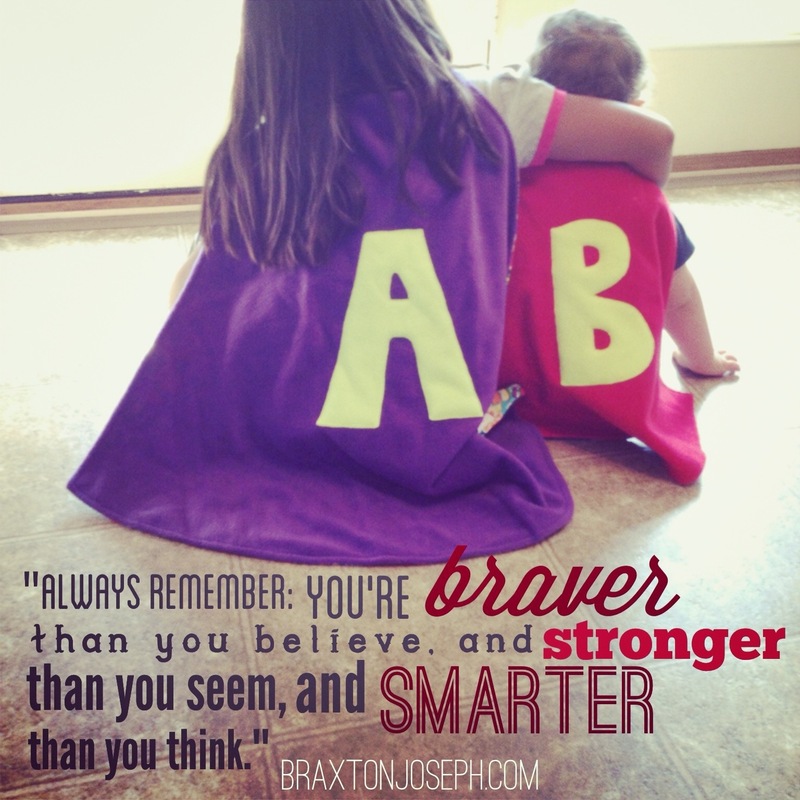 She’ll also continue to encourage Braxton with her new found super sidekick powers and reminding him that he is braver than he thinks, stronger than he thinks, and smarter than he thinks. The world better watch out for these two!